Target audience: Nonprofits, foundations, NGOs, cause organizations, Web publishers, educators, journalists, general public. Blackbaud, the Nonprofit Technology Network and Common Knowledge have just released the fourth annual 2012 Nonprofit Social Networking Benchmark Report. We learned a lot of things, but one prevailing theme stood out: Despite limited budgets and staffing, nonprofits continue to find great value in their fast-growing social networks. The report is packed with insights into how nonprofits are leveraging social networks as part of their marketing, communications and fundraising strategies. Have a look at the infographic below, and then download the full report to learn more about important behaviors and trends. 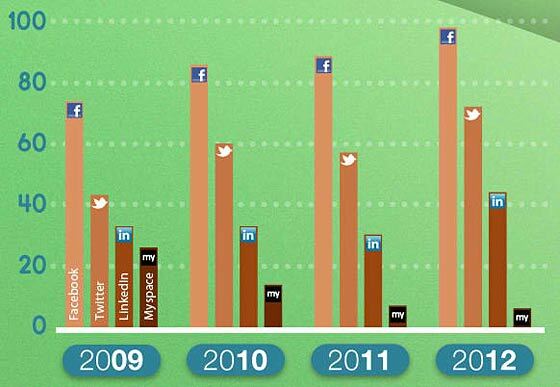 Average Facebook and Twitter communities grew by 30% and 81%, respectively. Average value of a Facebook Like is estimated to be $214.81 over 12 months following acquisition. 73% allocate half of a full time employee to managing social networking activities. 43% budget $0 for their social networking activities. The top three factors for success are: strategy, prioritization, dedicated staff.